(CNN) - What's the GOP’s latest weapon against Democrats? President George H.W. Bush’s fashion. The Republican National Committee is fundraising off of a pair of striped yellow, orange, green and blue socks it created under Bush’s name. And now, with the RNC's help, Bush basically has his own brand. “I’m a self-proclaimed sock man. The louder, the brighter, the crazier the pattern - the better,” he said in an email blast from the RNC. Donors can get the colorful pair if they contribute $35 or more. The socks are embroidered with the Republican elephant symbol and the 89-year-old’s signature. "When Chairman Reince Priebus asked me to write to you on behalf of the Republican National Committee (RNC), I told him I’d be happy to do it. But on one condition: my letter to you had to involve socks," he said in the email. You can bet Obama and the IRS will investigate. 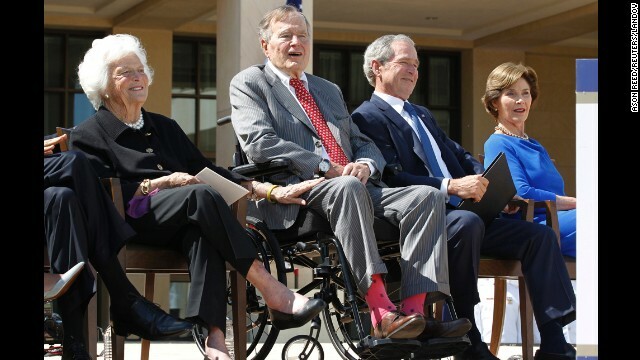 Well, it was Bush 41's socks, or Cheney's waterboarding towels. Socks work. Oh yes, the IRS will send the black helicopter, pick up the socks under cover of the hurricane Obama caused, and drop them in Area 51 in the Benghazi locker, guarded by the Death Panel. There – did I hit them all? I could only imagine the insults and accusations of degrading the office, but, its the gop, so its all good. $35 socks, $700 haircuts, $1000 shoes. We are the GOP, no ideas, lots of money. How hypocrtical and exploitive the RNC is. The reasonableness and gentelity of #41 IS NOT a chracteristic or trait of today`s GOP. He`d be called a RINO and PRIMARIED by the likes of Bachmann, Palin, or Blackburn [all versions of the same nitwit]. Democrats need to get cutthroat. Republicans try to latch on to Abraham Lincoln like they reflect his values . . . THEY DON`T They simply realize they can`t get the emancipationproclaimation back in the genie bottle so they might as well try to claim alliance with Lincoln. Lincoln advanced Federal Income taxes . . . are the GOP goons anti-IRS? He used "BIG GOVERNMENT" to redress abuses by the "states rights", pro-slavery crowd . . . the UNION Army, how`s that for big government. It`s laughable that the GOP tries to exploit the appeal of Lincoln and the same is true of the grandfatherly #41. But they didn`t touch #43 in 2008, 2012 and probably won`t in 2016. I`ll bet the Democrats fully embrace Obama in 2016 and beyond. As is widely reported, Hussein used these chemical weapons against Iranians in the Iran-Iraq war. After the 1991 Gulf War, U.N. inspectors “compiled long lists of chemicals, missile components, and computers from American suppliers, including such household names as Union Carbide and Honeywell, which were being used for military purposes” in Iraq. They could've gotten more for them I think. Wasn't a huge fan of him as President, would have traded him for his son in moment, but he's always been a good guy I thought. And had a bit more personality than showed through when he was in charge. You got to be desperate to be using someone socks to make money. Funny...when I think of Bush 41 and socks, I think of him buying socks at Walmart and being completely amazed by the register scanner...showing just how out of touch he was with the average American. ..Where are the socks that Dubya wore when he decided to ATTACK THE WRONG PLACE, IRAQ ? Next, they will auction off 43's underwear he had on when told about the Twin Towers! Craig – Thanks, you made my day. What's up right zingers your Koch daddies are having second thoughts about spending their monies. The GOP loves to be involved in anything that avoids a days work on unemployment, runaway healthcare etc. In other words, GOP Bush Bush blah blah Bush Bush Bush blah blah blah Bush Bush GOP Bush blah. Whatever it takes to enrage the electorate against the GOP, CNN. I look forward to more Bush-heavy reporting in the months leading up to the election. Or the cigar Bill Jeff Clinton was "not" smoking when he was told we could eliminate Bin Laden and decided he was too "busy" to give the go-ahead on the strike. I'll gladly take the Constitution-abiding views of those American heroes over the ideology this president clearly latches onto, which, whether you like it or not, it clearly that of Marx. Your rant lacks as much history and fact as it does grammatical excellence, which is amazing. It's easy to type out an emotionally charged diatribe of random nonsense, especially when you don't really have to debate a person in real time. If you ran into any intelligent conservative, they'd embarrass you quite easily and turn your own words against you in no time. Bush 43 ought to try that. There are plenty National Guardsmen out there who were thrown into the meat grinder of Iraq w/out adequate training or equipment who came back w/out feet from IEDs. Rummy comforted them by saying ,"You go to war with the Army you have." Why did America HAVE to go to war in Iraq in such a damn hurry that THE PLAN was such a SNAFU ? I wonder what Tom Steyer is getting from the Dems for his 100 million dollar donation? Maybe a box of cigars from B. Clinton.